In looking at the early history of economics, I've been struck by the thought that in economics, as in physics, every natural law is also an assertion of impossibility. In physics, for example, the Law of Conservation of Energy tells us that perpetual motion machines (or one specific kind of perpetual motion machines) will never work. In the same way, Say's Law, which I wrote about in an earlier essay, tells us that an economy cannot suffer from overproduction of all products and services, and as a consequence, that central planners or central banks can't bring about prosperity by putting more money into circulation. But Say's Law is only one of the laws of economics. Another great insight of classical economics was Ricardo's Law of Association, which, like Say's Law, can be given a conclusive mathematical proof. Ricardo's Law started out as an examination of foreign trade. A common fear about such trade is that it will impoverish one of the nations engaged in it. During the Industrial Revolution, the fear was that a country that had not yet industrialized would have so little ability to compete with industrialized countries (meaning, originally, especially in Ricardo's time, Great Britain) that it would not be able to sell anything it produced, and its economy would shut down. In the early Twenty-First Century, the fear is more that Asian (and, increasingly often, African) workers would accept such low rates of pay compared to Americans and Europeans that no one would hire an American or European workers, shutting down the economies of the developed countries. David Ricardo (1772-1823) showed that, except under very specific, indeed narrow conditions, this is not true. Foreign trade doesn't make either trader worse off. What are Ricardo's assumptions? First, that there are at least two producers. Second, that there are at least two useful or desirable products that both are capable of producing? Third, that one producer can produce more of either product than the other (or, which is the same thing, that it can produce either product at a lower cost). Fourth, that it has different factors of superiority for at least two different products. Suppose, to simplify the explanation, that each producer is one person. Call the two people A and B, and the two products X and Y. In the diagram, the amount of X being produced is shown on the horizontal axis; the amount of Y on the vertical axis. A can produce a small amount of X (shown as a point on the horizontal axis), or a small amount of Y (shown as a point on the vertical axis), or some of X and some of Y, cutting back on one to produce more of the other (shown by the slanted line connecting the two points). 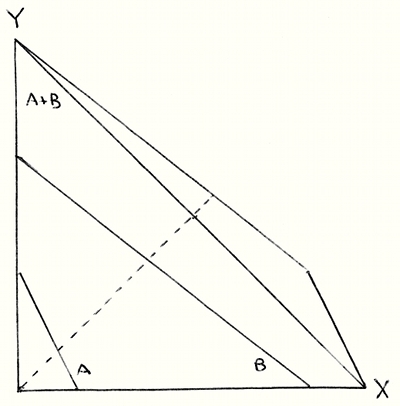 B can produce a larger amount of X, or a larger amount of Y, or can cut back on one to produce more of the other (shown by the slanted line next farther out). The amount of Y B can produce is a small multiple of the amount A can produce, but the amount of X is a bigger multiple. That is, A and B are unequally unequal. If A and B are both producing entirely X, the total amount they produce is obviously the sum of A's production and B's production; and likewise if they're both producing entirely Y. The same is true for any product mix combining the two, as long as A and B are both producing the same mix. For example, in the diagram, the dashed line shows product mixes with equal amounts of X and Y. The combined production of X and Y can be shown as a third straight line, farther out than the other two. This reflects a situation where the two producers don't specialize, and where they don't trade with each other. But there's a more efficient approach! Suppose that A wants to produce more Y. We can show this by moving upward by a certain distance. If we stay on the line for A, this requires moving to the left by a comparatively small distance. On the other hand, on B's line, moving up the same distance requires moving left by a much bigger distance. It may not cost B as many hours as A to produce one more unit of X; but in those fewer hours, B could have produced a much larger amount of Y. So A is giving up only a small amount of X to produce more Y, and B is giving up a large amount of X to do so. A has a comparative advantage in producing Y. So start out at the point where both A and B are producing nothing but X. If they want to produce some Y, having A produce it will cut down their production of X by a smaller amount; having B produce it will cut down their production of X by a larger amount. So at the outset, A should be the one to produce Y. The graph for this added production follows a line parallel to the line for A alone. A keeps producing more and more Y until he's working full time at it. At that point, and only at that point, B steps and and starts producing Y; the graph for this production is a line parallel to the line for B alone. The two lines together make a bent line that's above and to the right of the straight line for just adding up their separate efforts. A is inferior to B at producing either X or Y. But the inferior producer has something of value to offer the superior producer: The ability to concentrate on the work where her superiority is greater. And this isn't just a matter of these particular ratios; the same kind of diagram (it's called a convex body) can be drawn with any two straight lines that have different slopes. When we look at the real world, where people produce far more than two different products, it's almost unimaginable that any person, or any country, would be better than another person, or another country, by exactly the same multiple for all of those products. The less productive person always has something to offer the more productive! Opening up trade between two countries gives producers in the country with comparative advantage the chance to undersell producers in the other country, and even to force some of them to close down. But the other country will have comparative advantage in some other product, and its unemployed producers can find work in producing that. For a classic example, in the 19th Century, the emergence of industrial production and fossil-fuel power substantially increased the productivity of workers in industries from textiles to steel to precision machinery. Many countries tried to keep out foreign manufactured goods, fearing that their own economies would be destroyed. But there was another side to the balance: Even though industrialized countries might be able to increase their agricultural productivity also, most of agriculture was still powered by human and animal muscles, and by sunlight feeding plant growth. Whatever advantage industrial nations had in agriculture was smaller. By the end of the century, Britain had exported a large share of its food production overseas —for example, buying beef from Argentina and grain from Canada. The movement of British workers into factory jobs created an increased number of farm jobs overseas — not to mention jobs in shipping to move farm products internationally.